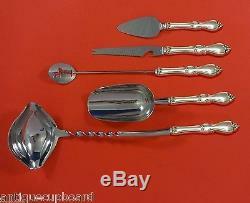 QUEEN ELIZABETH I BY TOWLE STERLING SILVER COCKTAIL PARTY BAR SET 5PC CUSTOM. QUEEN ELIZABETH I BY TOWLE. Get your cocktail party into full swing with this s terling silver hollow handle with stainless implements COCKTAIL PARTY BAR SERVING SET. 5-PIECE CUSTOM MADE, which includes. 1 - PUNCH LADLE (TWIST HANDLE), 13 3/4. 1 - ICE SCOOP, 9. 1 - MARTINI SPOON, 1 0. 1 - BAR KNIFE, 9 1/8. 1 - CHEESE SERVER, 6. It is NOT monogrammed and is in excellent condition. This is the perfect set for entertaining! What is a "Custom Made" piece? Custom made pieces are made from an original piece in your pattern that are not otherwise available or difficult to find on the market, especially in discontinued patterns. Hollow handle items are made from an original handle in your pattern with a new stainless or silverplated implement. Then the piece is hand-finished by a highly skilled silversmith in the USA. Now that many sterling patterns have been discontinued, custom pieces have become a staple in the sterling silver industry and are widely offered by mainstream sterling flatware dealers. Why isn't a Hollow Handle piece marked/stamped in any way? Yes, the hollow handle is sterling and a genuine handle in your pattern, even though it is not usually stamped. Hollow handle items were usually not stamped due to their hollow construction. Family Owned & Operated for over 50 years. We treat our clients as we ourselves wish to be treated. Customer service is the foundation of all that we do. In this fast-paced world we live in, you can count on us at Antique Cupboard to be committed to serve you, our customer. We sincerely appreciate the opportunity to earn your business. Why shop with Antique Cupboard? Antique Cupboard is trusted worldwide for no nonsense, fair, and honest dealings. Our prices and selection are tops. Our family has been a trusted source for fine sterling silver flatware & hollowware and fine estate jewelry for over 50 years. What started as a small family hobby in the year 1952 has grown into one of the largest sterling silver matching services in the country. Our flatware inventory consists of over 170,000 pieces, which includes the largest selection of Victorian silver in the United States. CUSTOM MADE ITEMS What is a Custom Made piece? Hollow handle items are made from an original handle in your pattern with a new stainless implement. INTERNATIONAL ORDERS: It is our pleasure to work daily with clients around the globe. We accept international orders from over 70 countries worldwide. These charges are the customer's responsibility. How do I return my product? This listing is currently undergoing maintenance, we apologise for any inconvenience caused. The item "QUEEN ELIZABETH I BY TOWLE STERLING SILVER COCKTAIL PARTY BAR SET 5PC CUSTOM" is in sale since Thursday, April 14, 2016.